A legendary investor's bet on big beer hasn't paid off as planned. 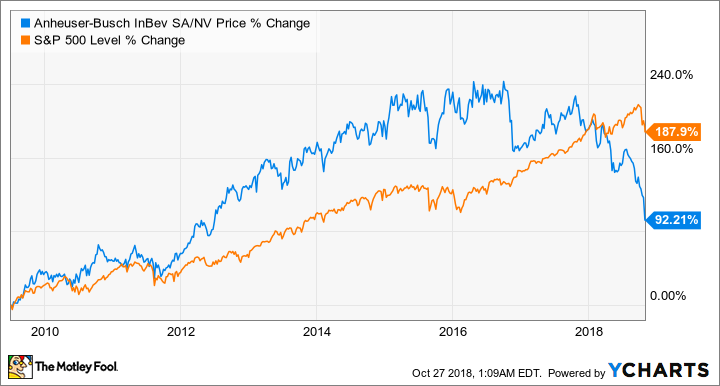 When 3G Capital engineered InBev's acquisition of Anheuser-Busch, which ultimately became Anheuser-Busch InBev (NYSE:BUD), it seemed like a guaranteed winner. The investment firm had had success generating value in global brands that operate in commodity consumer goods markets, and it seemed big beer was a logical target given its enduring power in the market. Over the last decade, AB InBev has consolidated about as much market share as it can globally, adding to its portfolio assets like SABMiller and a number of craft breweries. But the beer giant has lost market share and profitability in the last few years, undercutting the idea that bigger is better in beer. This is one big bet that I think has proven to be a bad idea for 3G Capital and other investors for reasons we might have seen a mile away. The idea behind consolidation in big beer was simple. Size would allow AB InBev to push smaller brewers around in bars and liquor stores (forcing them into less prominent placement on store shelves or out of locations altogether) around the world, and less competition between brands would allow companies to slowly raise prices and expand margins. 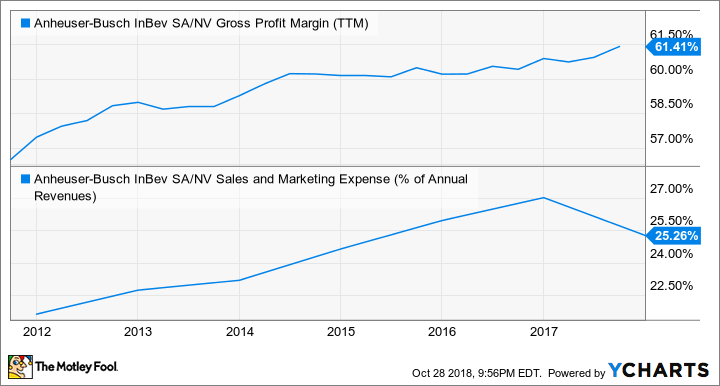 In the chart below, you can see that that part of the strategy has gone exactly as planned, with gross margin marching steadily higher over the past decade. What AB InBev didn't anticipate was big beer as a whole losing market share. AB InBev has had stagnant volumes in recent years and is spending more on sales and marketing than it did 10 years ago, just to maintain its volume. In the U.S., craft breweries' market share has increased from 5.7% in 2011 to 12.7% in 2017. In 2017 alone, overall beer volume sold in the U.S. fell 1.2%, while craft brewery volume was up 5%. International markets don't have the same craft brewery scale, but the shift toward local is happening all over the world, and that's bad for an international giant like AB InBev. Rising margins are good, but low/no growth and rising sales and marketing costs have offset the margin gains and undercut the entire notion of making big beer bigger. What 3G Capital didn't expect in consolidating brewers is that beer would start being a local business. According to the Brewers Association, there are 6,655 active breweries in the U.S. and another 2,500 to 3,000 in planning. These brewers are more nimble in responding to changing seasons and tastes than large rivals, and they're more ingrained in local communities than big brewers can ever be. Most major cities in the U.S. have a craft brewery scene that's a source of pride for locals and a draw for visitors. For a while AB InBev and other large brewers tried to buy their way into the craft brewery business, but they end up paying a premium for brands, customers often lose loyalty when big beer comes in, and there's limited impact on their operations given the scale big beer already operates in. In 2017, AB InBev abandoned the craft brewer plan, saying it wasn't going to be buying any more brands. There's no easy answer for big beer when it's suffering a thousand cuts from small brewers all at once. AB InBev continues to be a highly profitable business, and that may be enough for 3G and other investors. They could ride out the business as a cash cow, but there's no indication this will be a growth stock in the future, and there may be diminishing returns to further price increases intended to expand margins. Consolidation simply hasn't gone as planned in big beer, and the business may slowly lose market share as smaller rivals grow.